Son of a pastor, Johann Rist was born on March 8, 1607, at Ottensen, Germany (a village close to Hamburg). From his birth he was dedicated to the ministry. 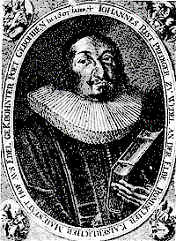 Rist studied at the Johanneum in Hamburg and the Gymnasium Illustre in Bremen, and then entered the University of Reinteln in 1626 as a student of theology. Under the influence of Josua Stegman there, his interest in hymn writing began. Rist was distinguished by precocious and varied talents; he visited several universities, including Leipsic, Utrecht, and Leyden, and studied mathematics, chemistry, and medicine, as well as divinity. In the spring of 1635 he married Elizabeth Stapfel, sister of the Judge Franz Stapfel, and settled at Wedel (just outside Hamburg, on the banks of the Elbe) were he accepted a pastorate seemingly due to his wife's influence. There he led 'a patriarchal and happy life' despite the bloodshed, famine, plundering and plague which characterized the era, although in the later years of the war suffering like others severely under its scarcity, terror, and pestilence. Rist remained in Wedel until the time of his death on August 31, 1667. He ministered both to the spiritual and physical needs of his people as a pastor and a physician. He was an active pastor and a great preacher, and insisted much on a certain strictness of life; for instance, he persuaded his people to abolish the customary merrymakings at Candlemas. Though he was a very strict Lutheran in doctrine, he was accused by some of the bigoted Lutherans of preaching too little against heresy and on controverted questions. His reply was "that he believed there were not above a couple of strangers in his congregation who held false doctrine, but plenty of people who led sinful lives; and to accuse men of heresy never produced a living, fruitful faith in them, only pride and impulses of hatred." But if he wisely did not preach controversy, he had no objection to print it, and he became involved in many very acrimonious disputes, theological and literary. He was in correspondence with all the principal clergymen and authors of his time, "so that scarce a day passed on which he did not receive a letter," then a matter of great wonderment. But he was most celebrated for his religious poems and hymns, of which he published ten collections, containing between 600 and 700 pieces, intended to supply every possible requirement of public worship or private experience. That in such a mass of writings on a limited range of subjects there should be a great deal that is very watery and poor was inevitable; many of his poems are evidently manufactured to order; others in the attempt to attain a little individuality sink into depths of bombast and bad taste; the wonder is rather that so many are really good, and some belong to the first rank of hymns. As a result, Rist's hymns were soon being sung all over Germany. Rist, however, never meant them for public worship but rather for private use, and during his lifetime they were never used in the church at Wedel. It is said that even the Romanists became deeply intrigued by them. His hymns invariably reflect an abiding trust in God and a fervent love to Christ. His first volume of poems, "The Poetical Pleasure Garden," was partly secular, but his after-productions were almost exclusively sacred, they were caught up eagerly by the musicians of the day, and quickly found their way into congregational use in Evangelical Germany, while even among the Roman Catholics they were read with delight, and one Empress lamented, "that it were a great pity if the writer of such hymns should be sent to hell." In his own day they were all admired: he was the most fertile, and next to Opitz certainly the most favorite, poet of the time. Honors poured in upon him: he attained the highest titles in Church and State open to a clergyman, and received from the Emperor the crown of poet-laureate in 1644, and a patent of nobility in 1653. Rist became a member of the Pegnitz Order in 1645, and the Fruitbearing Soceity in 1647. In 1660, he founded a society of "Swans of the Elbe," of which he was the head, as a sort of offshoot of the great Fruit-bearing Society, and by the members of this order, and indeed by many others of his contemporaries, he is lauded as the Northern Apollo, the Cimbrian Swan, the God of the German Parnassus; a certain little hill near his residence, where he was accustomed to write his verses, being the Parnassus in question. He died at the age of sixty, on August 31, 1667, at Wedel, Germany.